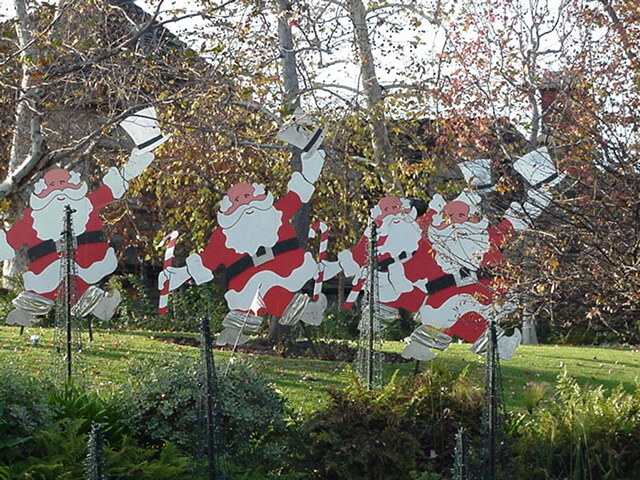 The Mad Santas of Beverly Hills! On the lawn in front of a mansion on Sunset Boulevard, not far from Rodeo Drive. It's all show biz out here. At the corner of Sunset and Crescent Heights there once was a famous drugstore, Scwabs, where it is said Lana Turner was discovered, sitting on a stool sipping a soda, looking pretty. The drugstore is long gone, as is Lana. The site changed hands a few times and now it's a strip mall with a McDonalds, a Subway and a few other fast-food franchises, along with a dry cleaner and a karate studio, and a discount beauty supply shop, and a few places where the women who long to be stars, who long to be discovered, can have their nails done. In front of one of these nail shops is this snowman. Kind of sad. No snow here, just what you see far in the distance, fifty miles away, on top of the mountains when its clear. No snow. No "stars." 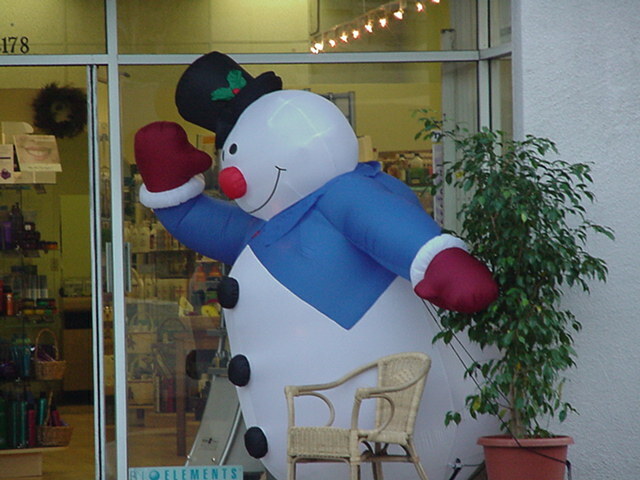 Just an inflated fake snowman at Christmas. Note that he is tied to the ficus so he won't blow away when the hot Santa Ana winds howl in off the desert. 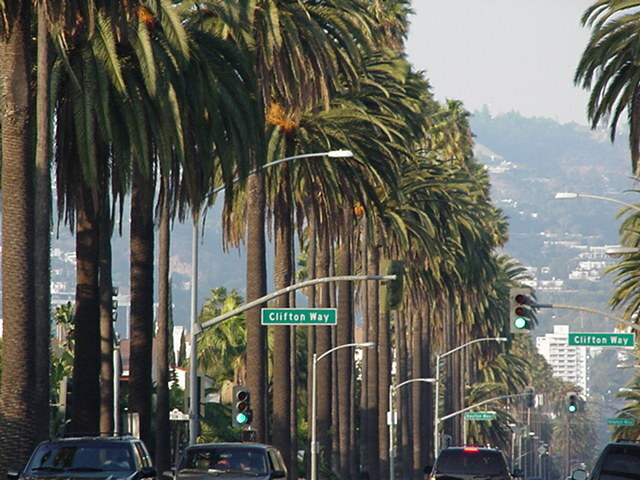 Some people get snow-covered pines in the dusk, but Christmas out here is a line of stately palms on Doheny Drive, just south of the fancy Four Seasons Hotel. 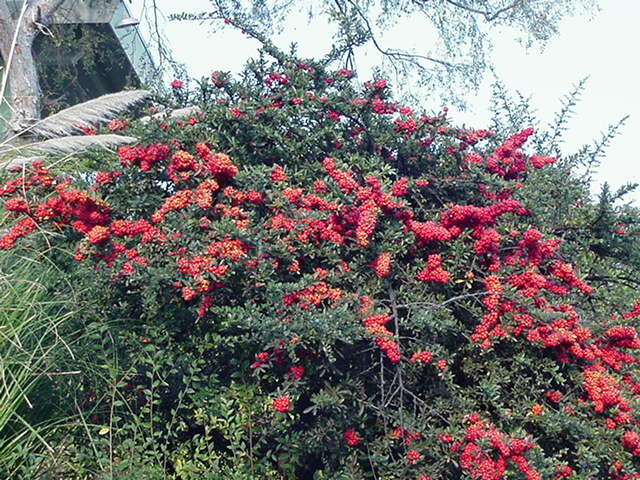 As I often like to comment, out here we don't get seasons - we get nuance. 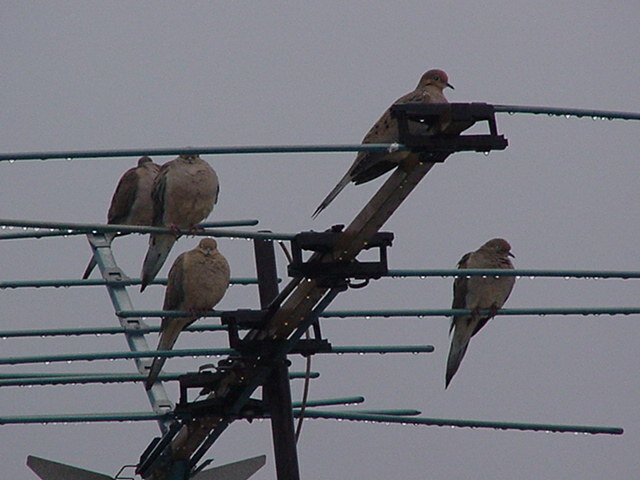 Ring-tailed doves in the early morning rain outside my window, very unhappy. And I have yet to see a white one. These will do. And the second picture is of their Christmas dinner, just up the street. Note: the "dove picture first appeared in the daily web log, As Seen from Just Above Sunset. 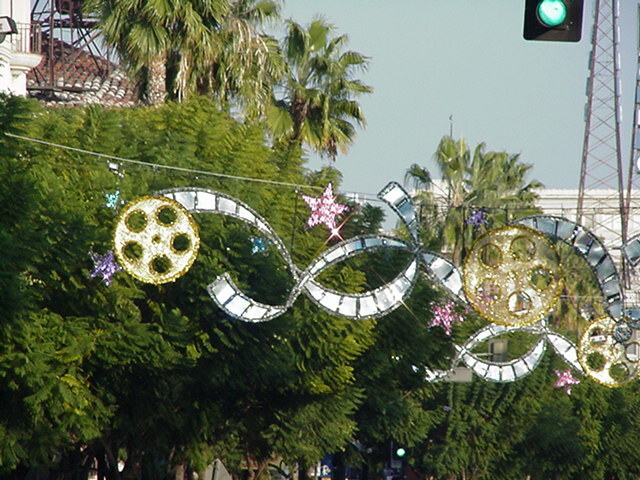 Another shot of the decorations on Hollywood Boulevard, famed differently - kind of arty I suppose. It gets lonely out here at the far edge of the continent. 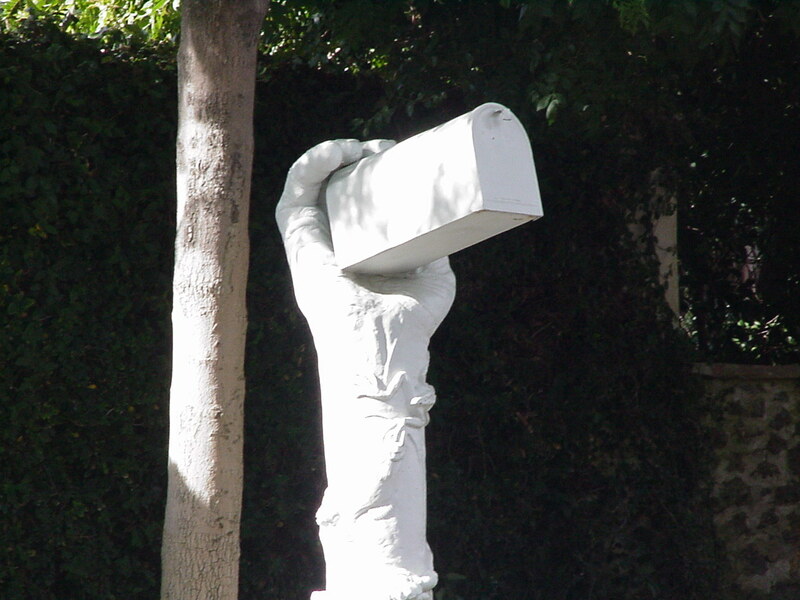 Do send mail; however, this is not my mailbox, just one on the edge of Beverly Hills that caught my attention as I drove by.